So, you want to get rid of saddle bags and you are not a horseback rider? Saddle bags, otherwise known as the excess protruberance on the upper outside of the thigh generally caused by excess fat. This muscle that we have located is called the Tensor Fasciae Latae and it is found on the outside of the thigh, crossing the hip joint from the iliac crest into the IT Band. It extends down past the outside of the knee to the tibia and is important in stabilizing the hip and knee when standing or walking. See a good view of the IT Band here. What kind of saddle bag exercises can I do? Standing tall and with good posture kick one leg out to the side only until you feel tension on the outside of that leg. Be sure you do not change the position of the hips by bending sideways to get more kick. Repeat this exercise to get rid of saddle bags to fatigue on each leg or about 10-15 repetitions. Lie on one side with your hips and shoulders stacked and waist lifted and lengthened, rest your head on bottom hand and place the other hand in front of you for support or on your side. Lift your top leg only to a 45 degree angle, keeping the knee straight and forward. Hold this position and rotate the leg out and then in (remember rotating in is the best way to activate those saddle bags), knee faces up then down. Repeat 5-8 times, then add circling the leg 5 times each direction. Change sides after completing both of the saddle bag exercises. In the side lying position add ankle weights or an exercise band tied to ankles. Lower and lift the top leg, repeating until muscle is fatigued. The feet can be parallel, turned in or out. This exercise can be done standing as well. 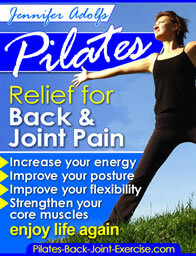 Pilates leg circles are very effective at working the upper inner and outer thigh. Shown here is advanced leg circles with a long leg. The longer the leg and the bigger the circles, the more this exercise works to get rid of saddle bags and strengthen the pelvic floor muscles. Try circling 8 times each direction keeping the pelvis still and anchored to the mat. Leave how to get rid of saddle bags and find more hip exercises by going here.